- 'Jet Set West' offers Currency Exchange of Canadian & US funds - located on upper level, inside security checkpoint (tel. 716-6333-0382, ext. 22209. - NEXUS e-Gate /Trusted Traveler and TSA Pre-Check (www.tsa.gov/tsa-precheck) are both available at BNA. The Upper Level is the Departures level housing the ticket lobby with check-in desks & ticket counters, a food court and security checkpoints leading to gate area - referred to as the 'Main Gateway Concourse' with gates 1 to 26 - after security check turn left for gates 6-1; or right for gates 7-26. Currently American Airlines & International Charter gates are to the left of the center, while Delta, JetBlue, Southwest & United are to the right of the center. Free work stations are at Gates 3, 14 & 20. Cell phone and iPod charging adaptors are available at Gates 4, 14, 20 and in the baggage claim area. Free power share stations are at gates 4-11, 14-18 & 22-25. The Lower Level is the Arrivals level housing baggage carousels, information desk, rental car counters, a hotel & ground transport desk, change machine,escalators/elevators to garage & level 2. 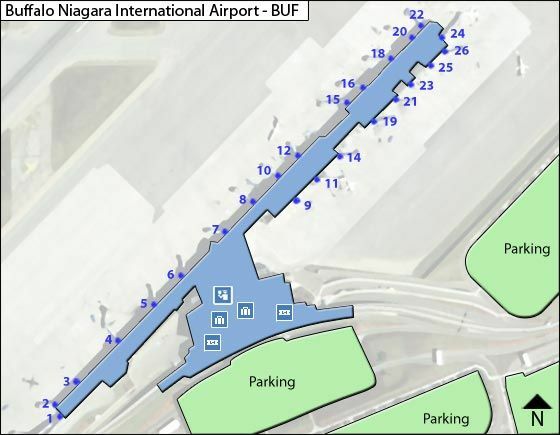 Outside of the Arrivals level are various transportation options: Passenger pickup & disabled parking spaces are in front of the terminal; while hotel shuttles/coaches & ppublic transit departs from the west side of this level. The outer lane, close to the parking garage is for airport parking shuttles, taxis, off-site rental car shuttles & limos, while across from it - inside the parking garage are limo- & rental car counters. - On your way to the Airport's Parking facilities, you can tune in to BNIA Radio 1580 AM - reception best about 3 miles before the Airport.